Magi political elections are imminent, and the factions are in need of a pawn. If Locke agrees to play the role, sorcery will be used to purge the venom from his body - though the process will be so excruciating he may well wish for death. Locke is opposed, but two factors cause his will to crumble: Jean's imploring - and the Bondsmage's mention of a woman from Locke's past: Sabetha. She is the love of his life, his equal in skill and wit, and now, his greatest rival. Locke was smitten with Sabetha from his first glimpse of her as a young fellow orphan and thief-in-training. But after a tumultuous courtship, Sabetha broke away. Now they will reunite in yet another clash of wills. For faced with his one and only match in both love and trickery, Locke must choose whether to fight Sabetha - or to woo her. It is a decision on which both their lives may depend. 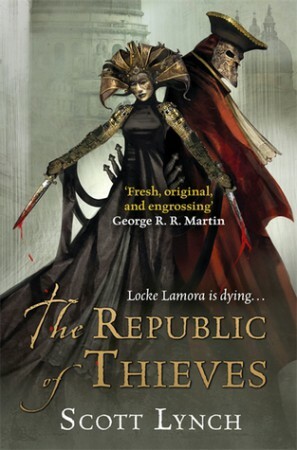 Even though The Republic of Thieves is my least favourite and, in my opinion, the weakest book in the series so far, I still bloody enjoyed it. You can’t beat a bit of Locke and Jean. I want to get my feelings for Sabetha out of the way first, because that was probably the biggest let down in all of history unless you count Ashes to Ashes. Because that was also pretty bad. Anyway, Sabetha was not what I was expecting at all. I do wonder if Lynch’s whole plan was to overhype her in the first two books so that when we meet her, we realise she’s just a normal (and somewhat dull… oops) woman that Locke has placed on a pedestal. If that’s the case, then Lynch did a marvellous job. If he wanted to show us what a goddess Sabetha is, however, he really should have worked on that. So yeah, I didn’t like her. And she was in this book a LOT. The flashbacks were bland in comparison to those in Red Seas Under Red Skies and The Lies of Locke Lamora, mostly because it was all about the romance between Locke and Sabetha. I also didn’t care for the heist in the flashbacks because I had tuned out just a little bit. The main heist of the novel also involves Sabetha. She’s working for the opposition and thus Locke and Jean have to try to out manoeuvre her. I enjoyed her bits a little more in the present day stuff, mostly because Locke and Jean had grown apart from her (and closer together) and so it was less draining. But anyway, enough of that negativity. I need to talk about the ending because WHAT WAS THAT?!!?!?! It’s the kind of ending that opens so many new doors and yet you’re not entirely sure it’s what it seems. I don’t know what to think, to be honest! It could go both ways. And there’s also stuff happening in the world at large that is going to change so many things and obviously Locke and Jean are going to get involved somehow. Lynch did a really good job of expanding this world over the course of three books and now everything has escalated to a point that this world and this fantasy series are becoming truly epic. I have so many theories that I don’t know what to think. So if anyone wants to talk about this book then I am ALL EARS. I can’t wait for the next one to come out next year (NEXT? YEAR?) and to see how everything progresses from where The Republic of Thieves leaves off. I’m almost tempted to reread the whole series so far before I read the fourth book because I feel like I need a) more Locke and Jean in my life, and b) I need to get a firmer grip on this world than I already have. If that’s possible. I both liked and disliked Sabetha. I can’t really put my finger on it, but sometimes I really loved her, and at other times I was just like “shut up, woman”. It’s really interesting that Scott Lynch can make me feel both ways about one character in one book. I agree, the ending leaves so man possibilities! I have absolutely no idea where Thorn of Emberlain will take us (and I’m SO excited to read that one). 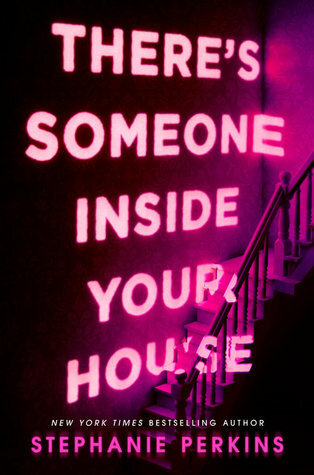 I REALLY need to read this. I read the first two books really close together, (conveniently) just before the third book came out, which was lucky. My boyfriend even bought me a signed copy… but I still didn’t read it. So many books, so little time, I suppose!